It’s amazing how the landscape can change in just a few short years. When the SIG P320 was introduced in 2014, I received one of the first models and reviewed it in these pages. I was somewhat unimpressed with the gun. Basically a striker-fired version of SIG’s modular double-action/single-action P250, the gun was reliable and had a nice trigger, but I thought it could have been so much more. Even before the U.S. Army adopted a version of the P320 as its new M17 service pistol, I realized I had underestimated the P320. Then SIG introduced the X-frame models (X-Five and VTAC), which seemed to address every complaint I had with the platform, however minor. SIG’s X-Carry model is meant to be the P320 tweaked to ultimate concealed-carry perfection. Let’s start with the basics of the P320 and work our way up to the X-Carry’s upgrades. This is a polymer-framed striker-fired pistol with an ambidextrous slide stop/release and a reversible magazine release. The standard P320 is available in 9mm, .357 SIG and .40 S&W, although the 9mm version is by far the most popular. Removing the chassis from the grip module takes just a few seconds. You then can swap out your grip modules for ones fatter or thinner, longer or shorter, to change the size and capacity of your firearm. You can also change calibers by swapping out the top end. The frame is undercut behind the trigger guard for a high grip, but most noticeable is the 90-degree trigger break, which helps eliminate side-to-side play during the pull. Trigger pull on the P320 was always good. The trigger itself is steel, and the trigger pulls on these guns always had nice, crisp breaks for striker-fired guns, although at six to seven pounds, they were a bit heavier than I prefer. The sights on the P320 are steel, and you have your choice of three-dot or three-dot night sights. The grip angle on the original P320 is more vertical than on most modern firearms. This didn’t seem to affect its shootability, but I was not alone in wishing for a more-angled grip. I bought a spare grip module for my P320 Compact and did some grinding and stippling to it, but there wasn’t much I could do about the grip angle. Then SIG introduced the X-series guns, and the multitudes cried with joy. Okay, maybe that’s a bit dramatic. But the X-series guns were exactly what everyone who liked the P320 wanted: P320s with more-angled grips, among other upgrades. The X-series guns had grip angles similar to the 1911, but with the X-guns SIG did more than just offer different grips. The company tweaked just about everything in the gun. The P320 X-Five is the P320 maximized for competition, featuring the new angled X-Frame. 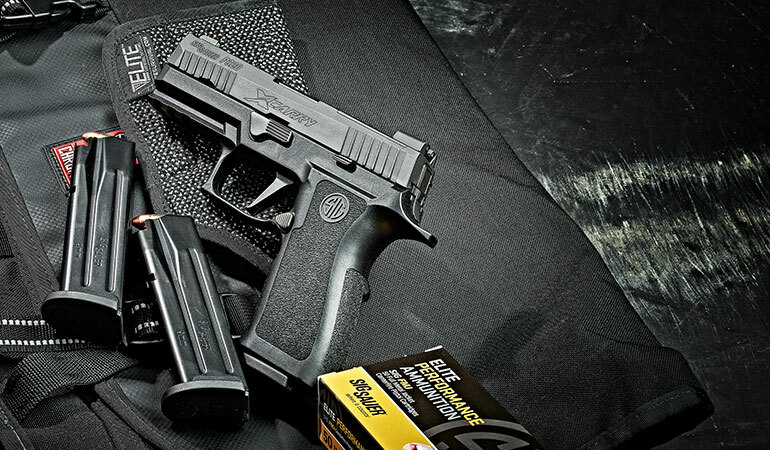 The star of this review, the P320 X-Carry, is the X-Five downsized for carry. Let’s talk size. The full-house competition X-Five has the longest barrel of any P320 at five inches even. It also sports the full-length grip that, in 9mm, accommodates flush 17-round magazines. The standard full-size P320 has a 4.7-inch barrel and full-length grip, and the standard Compact P320 has a 3.9-inch barrel and a shorter grip with 15-round flush magazines in 9mm. The X-Carry features a top end the length of the original P320 Compact, with a 3.9-inch barrel with target crown, but with a full-length grip. The X-Carry is 7.4 inches long including the beavertail and 5.5 inches tall with a magazine in place, which means this is far from a pocket pistol and you will need a good holster and a covering garment up to the task. The pistol is 1.3 inches wide. With an empty magazine inserted, the pistol weighs just under 27 ounces. Right now there is only one version of the X-Carry available, and that version is all black and chambered in 9mm. It is supplied with three 17-round magazines and a cable lock in a lockable plastic case. 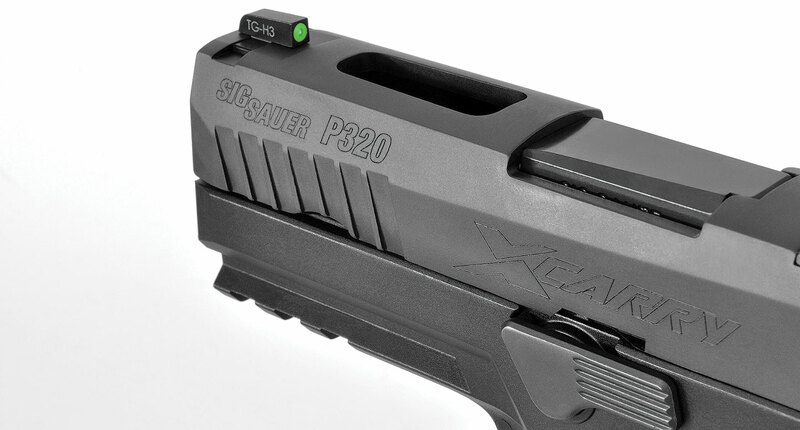 The X-Carry barrel has the same locking block as a standard P320, but it offers a much tighter fit than on a standard P320. There is absolutely no vertical play, so it appears this gun has been tweaked on the inside as well as the outside. The slide is stainless steel with a black Nitron finish. Construction of the P320 is about as corrosion-resistant as you can get, which didn’t hurt in the military trials. There is a trapezoidal lightening cut in the top of the slide between the barrel hood and the front sight. While I think this looks good, it isn’t just for show; reduced reciprocating weight means less felt recoil, and the X-Carry is meant to be maximized for performance as well as looks. The front sight is the SIG X-Ray3 night sight. The lightening cut on the slide looks good and also reduces felt recoil. The slide features flat-bottomed serrations at the front and rear. The serrations in the X-series guns have a slightly different angle to them to match the different grip angle and are a bit more aggressive than on a standard P320. The front sight is SIG’s X-Ray3 sight, which features a tritium insert and a large green circle around it for increased visibility in good light. The rear sight is not one that I’ve seen before from SIG, and I have to say that I like it the best of all the SIG rear sights I’ve seen and tested. There are tritium inserts on either side of a sizable notch in a blocky rear sight housing that provides a nice sight picture. From the rear it’s almost square in profile. 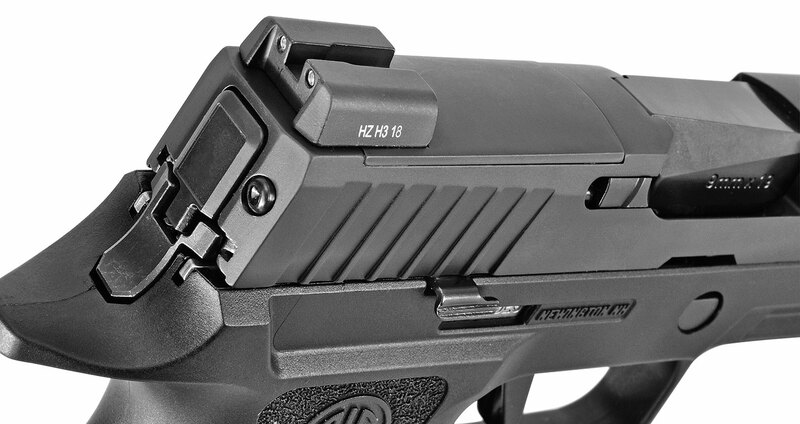 Tarr likes the rear night sight on the X-Carry more than any other SIG rear sight. It is mounted on a removable plate, with a slide cut to accommodate a SIG red dot. The rear sight is attached to a removable plate set into the top of the slide. If you remove the plate/sight, the slide is ready to accept a SIG Romeo1 mini red dot. However, here’s my only real complaint with this pistol. SIG likes to talk about how the plate is easily removed via two screws and then this pistol is red-dot-ready, but it neglects to mention you can’t access one of those screws until you remove the extractor assembly from the slide, and the company does not give you any instruction on how to do that. In fact, the owner’s manual reads: “Do not attempt to disassemble your pistol beyond the point explained in this manual. Further disassembly should only be done at the factory.” This is one of those “you can’t get there from here” scenarios. I think red dots on carry pistols are a fad that will lose popularity as people realize red dots are slower to use at defensive distances than iron sights. But more options for the shooter are always a good thing. Let’s talk about the X-series grip module. Yes, it has more of an angle to it, but the changes involve much more than just the angle. First, the original grip modules are almost oval in cross-section. The X-series grip has flats on the sides, which to my mind help you more naturally point the pistol. 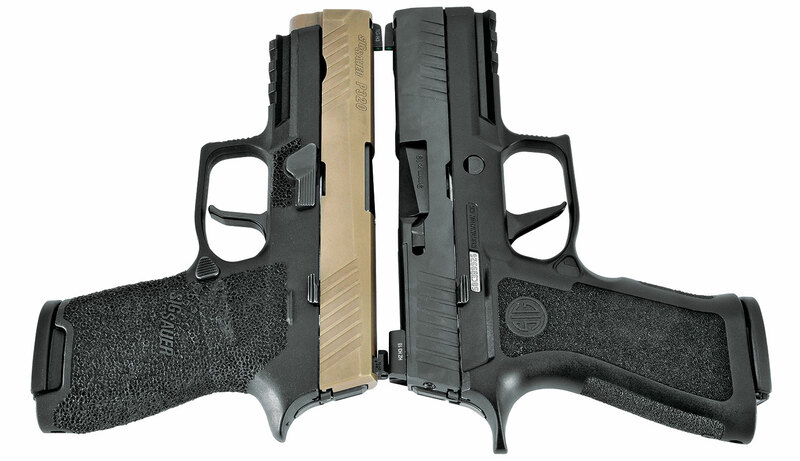 The SIG P320 X-Carry (r.) compared to a customized P320 Compact. The X-Carry has nearly the same dimensions while offering two more rounds in the magazine. The grip is cut a bit higher in back, with a beavertail. The high cut in back is paired with an undercut trigger guard to get your hand as high up on the grip as possible. Admittedly, when comparing original and X-series frames, the difference in grip height isn’t much more than 1/16 inch, but every little bit helps. The magazine well on the X-series sports a serious four-sided bevel to help speed and smooth your reloads. Magazines meant for X-series pistol will work in a standard P320—only the grip angle has been changed, not the magazine angle. Older magazines for the P320 might not work in X-series grips without a little grinding on the sides of the polymer base pad, but newer magazines are designed to be cross-grip compatible. You’ll notice the trigger on the X-series guns is also different. This is a straight, flat-faced trigger that breaks at 90 degrees, or darn close to it. Gun companies are discovering something that experienced shooters learned a while ago. Triggers, especially flat ones, that break at 90 degrees reduce the amount of side-to-side movement of the gun during the trigger pull, enhancing shooter accuracy. But since the trigger group is the same as on a standard P320, so trigger pull weight will be unchanged. Trigger pull on my sample was just barely six pounds. The slide and barrel of the X-Carry are compact, while the grip is full size. Many companies design “carry” models of their guns this way, but I think this is backward. It is the grip that prints against your covering garment, so the smaller the better for a carry gun, whereas a longer slide—at least when in an inside-the-waistband holster—doesn’t make the gun any harder to conceal, just easier to aim at speed. However, the full-length grip does allow everyone to get their entire hand on the pistol. A SIG video indicates the height of the X-Carry with its 17-round capacity is the same as the original P320 Compact with a 15-round magazine. I had both on hand so I measured them and discovered SIG is correct—as long as you don’t have the magazine in the X-Carry. 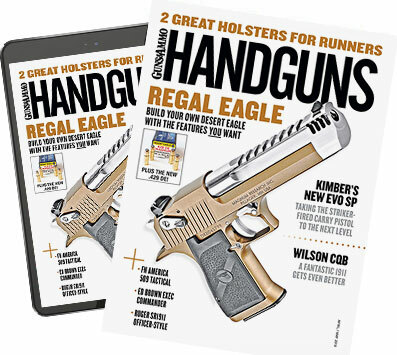 With magazine inserted the 17-round X-Carry is about a quarter-inch taller than the standard 15-round P320 Compact. It is only a quarter-inch longer (all in the beavertail) and a half-inch taller than a Glock 19. Since I brought up Glock, its G19X—a competitor in the Army trials SIG won—is nearly identical in size and offers the same capacity, but it’s cheaper than the P320 X-Carry, $749 versus $862. What do you get for that extra $113 for the SIG P320 X-Carry? A better trigger, better trigger pull, better sights, a slide cut to accept a red dot, beveled magazine well and forward cocking serrations. I think the SIG also looks a lot sexier. I can’t bring up the military trials without mentioning the issue the SIG P320 had—namely firing when dropped on the beavertail on a hard surface. This was due to the weight of the original curved steel trigger moving backward under inertia. P320 models with the lighter flat trigger—such as this and all the X-series guns—have never had this issue. 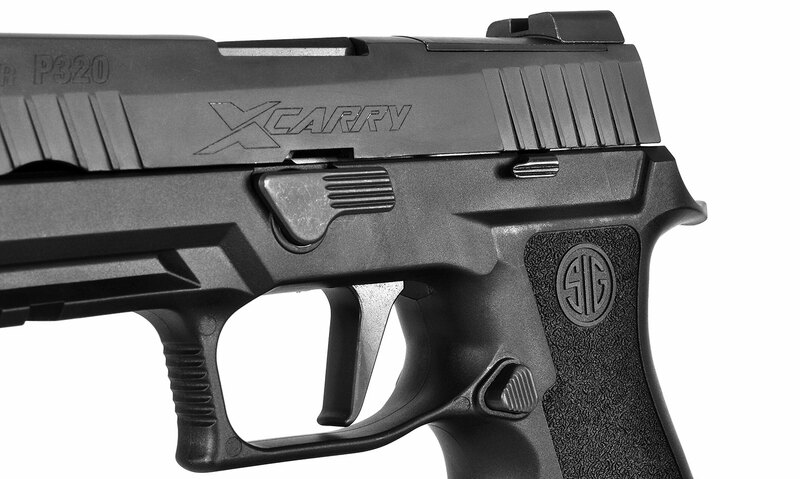 The X-Carry is the smallest gun in the X-line of pistols and is the easiest to conceal. That said, it is not a small gun, which makes it fun and pleasant to shoot. I could hammer steel and paper with it all day long. Some guns are introduced and just fade into history. With the military choosing the P320 as a new sidearm, this design will now forever be a part of American gun culture, and right now the P320 X-Carry is the ultimate version of this design for the concealed-carry market. Excellent reliability and better-than-average looks, sights, trigger pull, and ergonomics, the P320 X-Carry gives you everything you need.